Tackling the TM1 REST API by yourself can be challenging. To help you to start with, we have gathered all the main TM1 REST API queries in a ready to use Postman Collection. 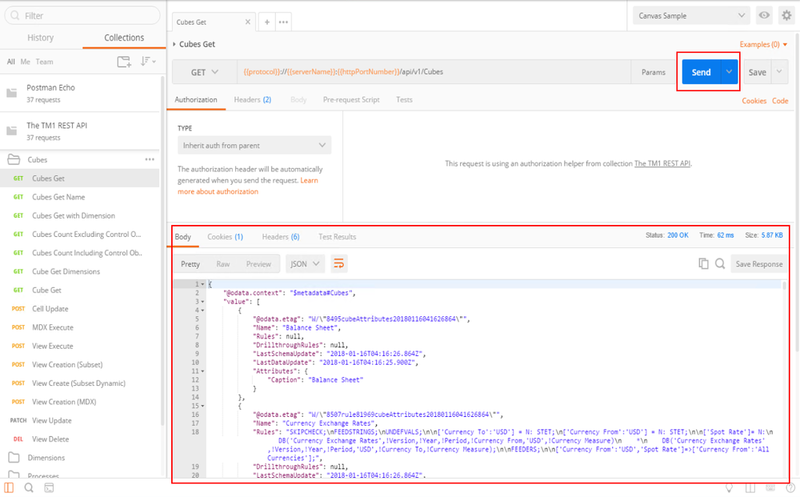 What you just need to do is to download Postman and then follow these steps to set up the TM1 REST API Collection for Postman. Canvas Sample.postman_environment.json: Contains information about the TM1 instance you want to query. The TM1 REST API.postman_collection.json: Contains all TM1 REST API queries. Set the proper credential in the Authorization tab. In this example we are using basic TM1 Authentication (mode 1). If it still does not work, you should check first your environment variables and then check if the TM1 REST API is enabled for your TM1 instance. You are all set! You can now run all queries. Do not forget to update the Environment variables to match the information of your TM1 instance and your TM1 objects you want to query such as cube, process and chore. If you interested of building web based TM1 planning and reporting application, you should have a look at Canvas which is a web development framework. If you want to integrate systems with your TM1/Planning Analytics application, you should have a look at TM1py which is a Python package that wraps the TM1 REST API in a simple to use library.